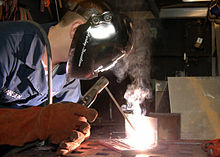 Do you have a passion for welding? If you have all of the machinery and safety equipment necessary to start a personal welding project, now is the time to start looking for inspiration. Welding is not only fun, it is a great way to entertain yourself while you create masterpieces to dress up your home or office to transform it into a unique space like no other. Here are some great project ideas for your home, care, or recreational space that you can make your own based on your level of experience with welding. If you are tired of paying top dollar for furniture at your local furnishings retailer, why not have fun and make your own coffee table out of scrap metal? If you have an old worn fence lying around, or pieces of steel angle and gauge steel strips lying around, you can tap into the creative side of your brain and turn these scraps into a table that will transform your living room. If you want an entirely different type of coffee table that will become a conversation starter, consider picking up titanium turbine blades at your local scrap yard and use them to create a futuristic piece. Are you looking for a special piece of equipment that will help you store and transport all of the safety equipment and filler metal you purchased at http://www.welding.com.au? If you answered yes, this is a great project idea that serves a purpose and still challenges you to use your skills. A welding cart and table is a great project to take under your belt. With the right design, you will have plenty of space to store your filler metals, welding gloves, and other materials you will need. You can even add wheels to make your welding equipment portable. Are you looking for a practical way to use your stick welder? If you want to start off with a personal project and you love surfing or body boarding, why not create a roof rack for your truck or your automobile? With the appropriate steel rods, the right vision, and some time, you can make roof racks for your own vehicle, save hundreds, and take pride in the equipment that you place on your vehicle. This is a project that will pay off for years to come. There are hundreds and hundreds of welding projects you can try at home in your spare time as you get more skilled with your equipment. From metal art and decorative garden furniture, to outdoor archery stands and freestyle skateboarding ramps, the sky is the limit. Think about the things that you want around your home, and make a priority list. Once you complete your first project to your liking, you are sure to skip to number 2 on your priority list of welding project ideas.